studio trumpet and serves as the Brass Area Coordinator. He is currently Vice-President/President-Elect of the International Trumpet Guild. A Merry Christmas with Brass for the Word Label. He has performed in solo and chamber settings in Canada, Spain, Poland, England, Sweden, Thailand, Russia, Australia, and the Czech Republic. for the trumpet by American composers. Peters has performed the World Premieres of Richard Faith's Evocations (2005) for trumpet and piano; Michael Murray's What is it For? (2003) for trumpet and organ; Kenton Bales' From the Hills (1999) for trumpet and wind ensemble; Robert Frank's Liturgical Impressions (1986) for trumpet and organ; and the European Premiere of John Prescott's Toccata and Fugues (1999) for two trumpet and organ in 2002.
works for solo trumpet with piano and chamber ensembles. In December of 2009 he produced and performed with the Missouri Chamber Players on Rhapsody, a recording of chamber music by American composer Richard Faith for the MSR Classics label. Peters holds the Bachelor of Music in Education degree from the University of Nebraska - Lincoln, and the Master of Music and Doctor of Musical Arts degrees in Trumpet Performance from the University of North Texas. His principal teachers include Dennis Schneider and Leonard Candelaria. 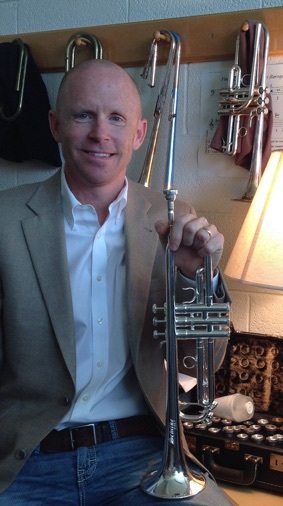 Dr. Peters is an Artist/Clinician for Schilke trumpets.